1. Well, ok, maybe _____. 2. _____ that's a stretch! 3. When I'm making _____. 4. _____ a bit healthier. 6. _____ root of all evil. But _____. 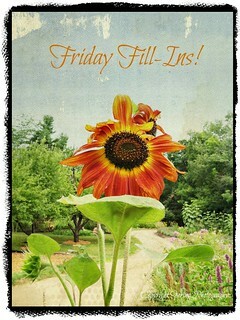 Hello Friday, mine is posted HERE! :) Enjoy! First time in a very looong time to link up, but am playing today. Join me, if you wanna at Friday Sillies #37 - Political Parody & Fill-In Fun!" Mine are posted here!! Have a great weekend! Hope you don't mind I borrowed your graphic today, I couldn't resist the colors. Mine's Up.! and I'm Back! A little late, but it's up. Actually found a theme for it, and all the answers roll together (which rarely happens for me). New to join ... even if it is a few days late!